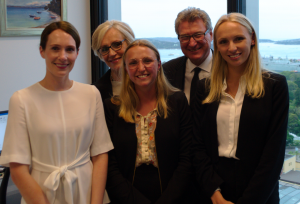 On Tuesday 11 December the Australian Institute of International Affairs and the International Law Association (Australian Branch) awarded the 2019 Peter Nygh Hague Conference Internship to Sophie Yates at a ceremony at Resolve Litigation Lawyers in Sydney. The Institute was represented by Richard Broinowski, immediate past president of the AIIA in New South Wales. Dr Peter Edward Nygh AM (1933-2002) was a leading international lawyer, professor of law and founding head of Macquarie University’s Law School. He was a judge of the Family Court of Australia from 1979 to 1993 and Principal Member of the Refugee Review Tribunal from 1998 to 2001. Dr Nygh was also an Australian delegate to, and a rapporteur of, The Hague Conference on Private International Law. Dr Nygh’s family donated funds to establish the Peter Nygh Hague Conference Internship. The Internship provides funds for travel and living expenses for a graduate or post-graduate student from an Australian law school to undertake an internship with The Hague Conference in the Netherlands. Sophie Yates graduated from the ANU as a Bachelor of Arts and Bachelor of Laws with First Class Honours in November 2017. She has a strong interest in private international law; her honours thesis on the “foreign act of state” doctrine developed a set of rules and exceptions to guide Australian courts on the legality of foreign government conduct. In her Arts degree she majored in international relations and minored in Spanish language and culture. Sophie is currently working as a tipstaff to the Honourable Justice Stevenson in the New South Wales Supreme Court and was admitted as a solicitor of that court in July 2018. She has undertaken an intensive course in Commercial Law at the London School of Economics and an exchange at Kobenhavns Universitet to study Danish and European Union law. At the Hague Conference she will participate in the Diplomatic Session for the Adoption of the Hague Convention on the Recognition and Enforcement of Foreign Judgments in Civil and Commercial Matters.